The news comes as high-profile EU representatives warned at a summit in Salzburg that a deal with the UK prepared under Theresa May's guidance was "far away" and that the issue of the Irish border "backstop" and post-Brexit trade arrangements should be renegotiated. 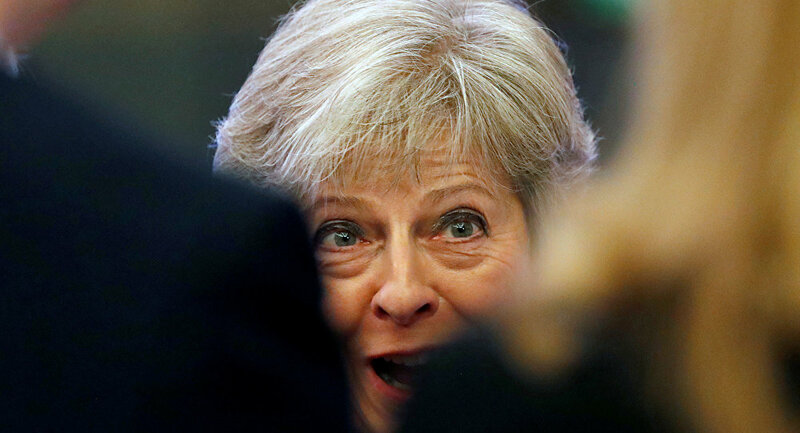 An internal dossier has been circulated among Tory MPs, suggesting that British Prime Minister Theresa May will be asked to leave her post soon after May 2019. The memo, seen by The Telegraph, details that the 1922 Committee, an influential group of Tory backbenchers in the House of Commons, will invite the PM to "stand down soon(ish) after March 2019." This assumption is followed by a brief yet uncompromising analysis of all 27 of Theresa May's possible successors as Prime Ministers, who include members of the cabinet and other contenders. The dossier, reportedly drafted by an unidentified Tory MP, argued that it was "too late" for former Brexit Secretary David Davis to push for the highest job in British politics. Liam Fox, Secretary of State for International Trade, was described as "fading," while Chancellor of the Exchequer Philip Hammond, who "thinks he has a chance," was named a hopeless case. Jeremy Hunt, who replaced Boris Johnson as British foreign secretary in June, was called a "dark horse, near the front of the pack coming up on the rail." The memo added, "Note John Major 1990," referring to the former Prime Minister, who clinched an unexpected victory in the 1990 election. Mayor of London Sajid Javid is considered to be aspiring for the highest job in No. 10, with his possible strategy being described as an attempt to recover from "Referendum positioning error." "Bookies favorite" Boris Johnson's chances of becoming PM were described as dim, as "the front-runner never wins." Brexit Secretary Dominic Raab emerged as another major contender, described as having "discreet support" from the European Research Group and being an "adroit talking head." His assessment concludes: "Might well succeed." The candidacy of Andrea Leadsom, Leader of the House of Commons, was dismissed as "totally unsuitable," while Minister for the Cabinet Office David Lidington was called "a Remainer, but not incredible." Defense Secretary Gavin Williamson is thought to be "in full campaign mode, but very reliant on PM controlling her own departure point." ​MP Tobias Ellwood was praised as a "very popular Remainer and highly respected. On an upward curve." The bombshell dossier was leaked to the press at a time when Theresa May is desperately trying to sell her Brexit plan to EU negotiators. On Wednesday, EU President Jean-Claude Juncker said at a EU summit in Salzburg that a deal remained "far away," as European Council President Donald Tusk said that Northern Ireland's borders and UK-EU trade relations still have to be "reworked and further negotiated." At the informal gathering with fellow European leaders, Theresa May once again rejected Brussels's proposals for a revised Irish border, as the EU insists on keeping Northern Ireland in the single market and setting up a hard border between the region and the rest of the UK. The EU has turned its back on May's so-called Chequers deal, which proposed a free trade area based on a "common rulebook" for goods and an independent trade policy for London outside the customs union, citing concerns that it would undermine the European single market. The clock is ticking for the parties as the UK leaving the bloc without a trade deal would see the EU and UK trade on bare WTO terms, which, according to an IMF report dated July, would reduce European GDP by up to 1.5 percent and bring even greater economic losses to the UK.